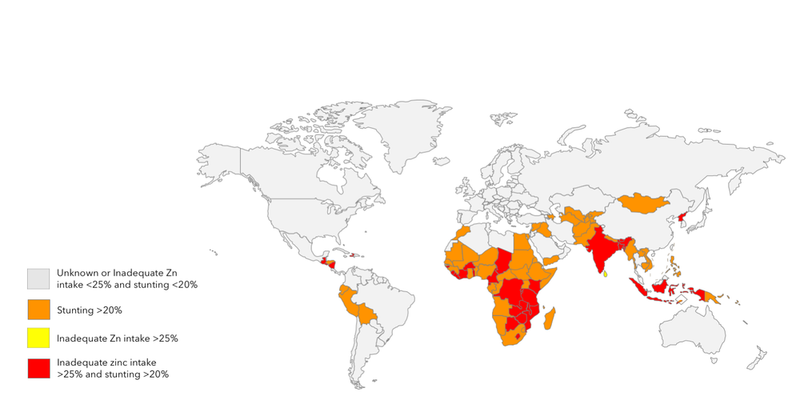 There is an urgent need for more and better data on the zinc status of vulnerable populations to effectively target and monitor zinc intervention programs. The prevalence of child stunting and estimated absorbable zinc in the national food supply can be used as proxy measures to estimate the risk of zinc deficiency. Based on national food balance sheets, it is estimated that at least 17% of the world’s population is at risk of inadequate zinc intake. However, data from national surveys that have included plasma or serum zinc assessment show that intake based on food balance sheets underestimate the risk of zinc deficiency. In 13 of 19 surveys, the prevalence of low plasma/serum zinc concentrations in young children was >20%, indicative of a public health problem. To confirm the prevalence of zinc deficiency, it is recommended to measure plasma/serum zinc concentration and/or dietary zinc intake in countries identified at high risk of zinc deficiency based on a high stunting prevalence or high prevalence of inadequate zinc in the food supply. Plasma/serum zinc is now part of WHO’s Micronutrient Database hyperlink https://www.who.int/vmnis/database/en/.